For other places with the same name, see Sławno (disambiguation). 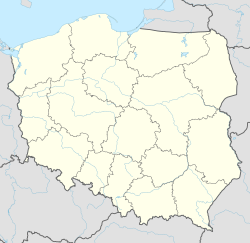 Sławno [ˈswavnɔ] (Kashubian/Pomeranian: Słôwno, German: Schlawe), is a town on the Wieprza river in Middle Pomerania region, north-western Poland, with 13,322 inhabitants (2006). It is the administrative seat of Gmina Sławno, though not part of it. The town is also the capital of Sławno County in West Pomeranian Voivodeship since 1999, previously in Słupsk Voivodeship (1975–1998). Sławno is a railway junction on the major Gdańsk - Szczecin line, with access to secondary importance connections to Darłowo and Korzybie. It is also a stop on the European route E28 running parallel to the south coast of the Baltic Sea between the cities of Koszalin and Słupsk. Since the mid-12th century the Lands of Schlawe and Stolp (Słupsk) were under the rule of Duke Ratibor I of Pomerania and his descendants, a cadet branch of the Griffin dynasty. When the line became extinct about 1227, their estates were the matter of an inheritance conflict between the Griffin Duke Barnim I the Good and Swantopolk II from the Samborid dynasty, who ruled over the adjacent territories of Pomerelia in the east. Swantopolk prevailed, his son Mestwin II, duke in Pomerelia from 1266, however again had to deal with claims raised by the Pomeranian Griffins and also by his brother Wratislaw II. To secure his rule, Mestwin accepted the suzerainty of the Ascanian margraves of Brandenburg by the 1269 Treaty of Arnswalde. Upon his death in 1294, the Samborides became extinct and the Brandenburg margraves seized their lands. Waldemar of Ascania finally separated Sławno from Pomerelia, which he sold to the Teutonic Order by the 1309 Treaty of Soldin. He nevertheless lost the town to the Griffin duke Wartislaw IV of Pomerania in 1317, whereafter Sławno remained a part of the Pomeranian duchy until its dissolution in 1637. Duke Wartislaw IV enfeoffed Peter von Neuenburg of the Swenzones noble family with Sławno, who granted the settlement city rights in 1317. The Gothic St Mary's Church was consecrated about 1360. Devastated throughout the Thirty Years' War, the town was allotted to the Brandenburg Province of Pomerania by the 1653 Treaty of Stettin. Sławno suffered heavy destruction during the Second World War and its entire German population was expelled in 1945. Wikimedia Commons has media related to Sławno. This page was last edited on 3 March 2019, at 09:55 (UTC).